Healthcare providers like you are feeling the impact of government regulations, and compliance requires a huge investment of time and resources. On top of that, patient-centric solutions are needed to help manage today’s complex health-care demands. The adoption of new technologies, like Electronic Health Record (EHR) and networked mobile devices, only adds to those challenges. 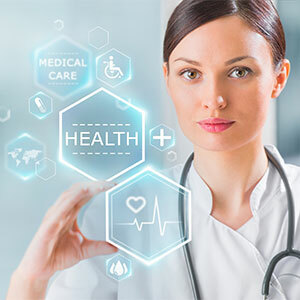 We offer technology solutions that help achieve greater efficiency, improve patient satisfaction, maintain confidentiality, integrity, availability of data, and meet your business goals. Our innovative technology solutions not only help you control costs, they’ll also put you in control of your systems and data, maximize your operations, and help you avoid potential risk. The lack of risk identification and awareness is costing healthcare organizations like yours millions of dollars each year. With the majority of those costs coming from security breaches and lack of compliance, it’s more crucial than ever to understand your risk position. Our dedicated team of Business Risk experts can guide you toward the best solutions to reduce risk and ensure confidentiality, compliance, and resiliency. Structured specifically for clients seeking HIPAA/HITECH compliance, we offer a variety of Cloud options that can be tailored specifically for each client’s unique needs. All solutions incorporate recognized best industry security standards. Solutions include platform options, from enterprise, to private to recovery models and work with multiple operating systems. Avoid loss of business, heavy fines and damaged reputation – control costs and maintain compliance with HIPAA-Compliant Cloud solutions. Hi-Link Technology Group can also help you take advantage of advanced data center technologies as well as network-enabled communication, collaboration and security tools.